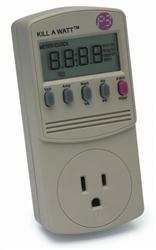 Kill A Watt™ Electricity Monitor - Save Money On Utility Bills! This P3 Kill A Watt™ Electricity Monitor helps you quickly and easily find out which appliances are the energy abusers in your house. Simply plug it into a 3-prong grounded wall outlet, plug your appliance, computer, lamp, or other electrical product into the monitor, and you'll find out how efficient (or wasteful) it really is. A large LCD display allows you to monitor the kilowatt hour (kWh) consumption each item and how much it costs to run by day, week or month. You may cycle through displays including voltage (volt), amperage (amp), wattage (watt), line frequency (Hz) and power factor (VA). This device is great for monitoring how much your devices are using. I have one for the entertainment center one in each of the bedrooms I have small space heaters in. Keep it plugged in and it tells you total kwh's used.